From New York Times columnist Ross Douthat, a very worthwhile new book on the state of religion in America, Bad Religion (Free Press 2012). Douthat argues that the consensus “mere Christianity” that until recently provided a common political culture for America has collapsed. 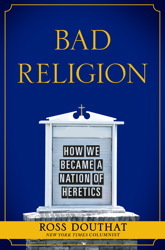 It has been replaced, not by the New Atheism of Dawkins and Hitchens, but by a collection of “heresies” that encourage self-absorption and weaken public life. These include, on the Right, the Gospel of Wealth, which teaches middle-class strivers that God will make them rich, and, on the Left, the New Gnosticism of academics like Elaine Pagels, which encourages people to imagine a Jesus they find congenial. Most influential of all, Douthat argues, is the “Spiritual but Not Religious” movement, which rejects organized religion in favor of “the God Within.” It’s not that these “heresies” are altogether bad; insofar as they promote tolerance, they’re beneficial. It’s just that, in Douthat’s view, the collapse of traditional Christianity means that nothing exists to temper their worst impulses. “The result,” he writes, “is a society where pride becomes ‘healthy self-esteem,’ vanity becomes ‘self-improvement,’ adultery becomes ‘following your heart,’ greed and gluttony become ‘living the American dream.’” He is especially good at explaining the social reasons for decline of Christianity since the 1960s and the religious commitments, such as they are, of the Millennials, who, if one credits surveys, somehow combine an ethic of not making other people feel bad with a remarkable lack of empathy. His description of what a recovered Christianity would look like is a little vague, and I suspect that most secularists, notwithstanding his claim that they too have a stake in Christianity’s revival, will remain quite content about the religion’s eclipse. Nonetheless, this book is a must for people who wish to understand religion in American today. What’s more, it offers insights about the essence of Christianity itself – a religion, Douthat insists, that forgoes easy answers in favor of paradox.